I started this baby quilt as part of my post for Craft Buds Craft Book Month in September. 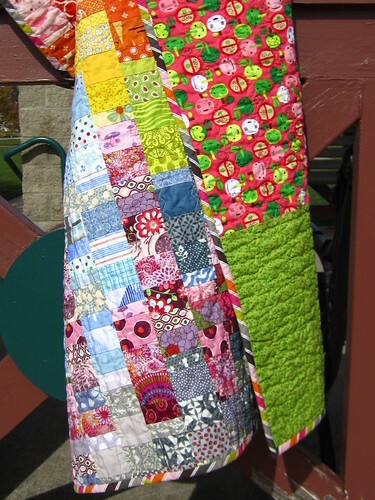 The pattern is from Emily Cier's book Scrap Republic, which offers 8 bright and colorful patterns and loads more ideas for using scraps and mixing things up. 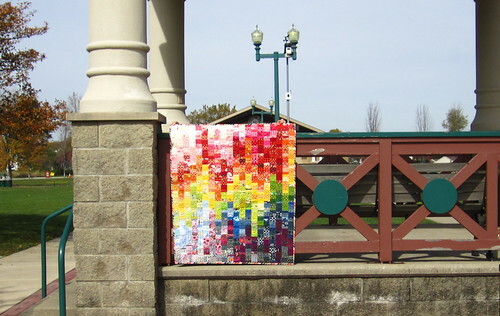 When my turn came around to post for Craft Book Month, I only had the quilt top done -- you can see that post here. I decided to finish this quilt as a baby quilt for someone special, so I sifted through my stash looking for potential backing fabrics. Luckily, the front is so colorful that almost anything looks good on the back. I decided on a large piece of this pink apple print that I'd picked up at a backroom clearance sale at my mom's local quilt shop in TN. 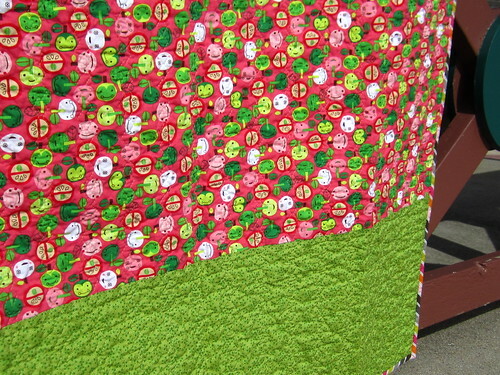 I added a coordinating green print from DS Quilts to make up the difference. 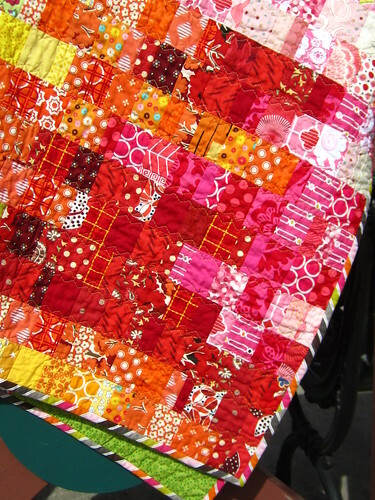 This small quilt with straight column seams was a great opportunity to experiment with some new machine quilting. I used my walking foot, increased the settings for my zigzag stitch, and quilted on either side of each vertical seam. With so many seams in the piecing, I think any denser quilting patterns would have made the whole thing just too stiff. The minimal zigzag quilting secures the quilt and adds enough visual interest and texture without going overboard. For binding, I got lucky and had enough of this bias stripe left over from another quilt (seriously, I had about 6 inches to spare - perfect fit!). The colors were right, and I was happy to not have to make binding for a change. I love how this quilt turned out. Everyone who sees it in person says "It's so much smaller than it looked in your photos!" But I think that surprise is part of the fun, and it makes for a perfect baby quilt. I can't wait to send this one off to its new home where I know it will be used and loved for a long time.